Almost every day I have been aware how forces larger than me & my will, form & influence my life, my perception & behavior. Sometimes I despair when I feel beaten by fate and oftentimes I feel carried to (heroic?) deeds or gifted with talent and resilience. In this retreat I want to explore powers, myths and legends from your ethnic and family culture & how they shaped who you became and who you are still becoming. I want us to tell stories, sing songs that celebrate men, dance dances where dream figures or legendary men emerge and show us how we could be. I want to explore the restrictions we experience as individuals and men, and how we keep finding strength or power & inspiration for change and for realization of our dreams. We will use meditation, dynamic yoga and other awareness and consciousness raising exercises used in Processwork, Body- & Art-Therapy, Martial Arts and from other sources. Ivan Verny is a 60+ man, psychiatrist, processoriented psychotherapist, husband & colleague of a great lady & father of two adult daughters. Over 30 years of seminar leadership (self-experiential, System Constellation Work, Processwork & Men’s Retreats) in CH, CZ, D, GR, IL & USA. He has been continually exploring male & mixed relationships, movement and the art of living. He is curious & passionate about communication, friendship, skiing, horseback riding and life long learning. Tea - all day long. Afternoon block - centered on creativity (painting, sculpturing, writing, dancing), voice work, body symptoms or work in the middle on personal issues. We’ll need paper, crayons & clay. Male issues can be how do you define yourself as a man. We will be fasting the first 6 days – then slowly start eating. Nobody needs to suffer hunger in my retreat. Drink plenty of tea through the day and cleanse our bowel every other day to prevent uninvited symptoms. Please start looking / listening & hunting for stories, songs, fairy tales from your childhood and youth; stories that fascinated or even scared you, stories about your male ancestors, about gains and losses and other bends of life. Try to remember or ask your parents or siblings what books, movies, TV-serials or records were fascinating you before school, in early adolescence, early adulthood (20ies), towards the end of your studies (+/-28), as you were or are speeding up your life (more work, less time, ca. 35 yrs). Dig out photographs from different stages of your life, and maybe even pictures of your male ancestors or models. It’s important to know that a 6-day-fast is an integral part of my men’s retreats. It enables us to have more time and a to find a different kind of energy or atmosphere. I have over 20 years of fasting experience and i know ways how to stand a longer fast. The group dynamics of an 9-day retreat combined with 5.5-day-fasting can be quite a demanding experience and with 20 years of experience of leading men’s retreats i like a thorough preparation. Every man has to be capable to keep a certain order and respect to himself, others and environment. Polemics or conflicts about given facts is a loss of energy that is needed for your personal development and could steal energy from other members of the group. Every man is present in the group during the group blocks, even if he needs to take a nap. You’ll have a 3hr-midday-break for introversion. You can also write there if you need further information, clarification, etc. Get a diary now - I recommend you to write a “log book” of your quest from now on . 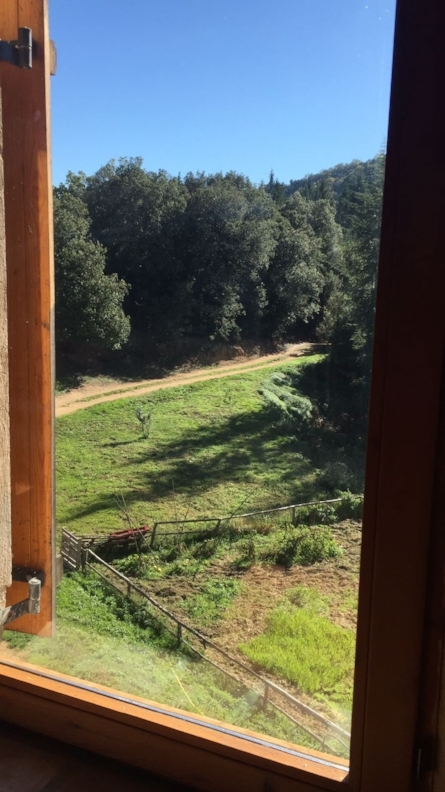 We will stay at "Can Feliu", a house in the Montseny Sierra, the accommodation will be in shared rooms. In the map at the right you have how to get there. the house is isolated in the middle of the forest. From September 8th till Sept. 16th, the retreat open on the 8th at 16h (Wellcome and Reception of participants from 16h to 18h) and ends the 15th at 13h. We try to make the retreat affordable for all people. As participant you contribute to that paying the higher price that you can afford. Price include food and accommodation from the 8th at night to the 16th in the morning. Confortable clothes, a notebook, pen, pencils, crayons. Bring a bow & arrows if you own some, if you have boxing gloves let me know and bring them as well. Any board or ball game is welcome. As is your music instrument and music & movies on electronic carriers.